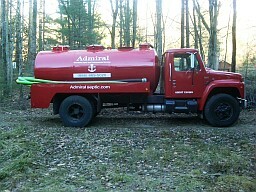 Septic Inspections - Admiral Septic serving Hartford County, Tolland County, Windham County CT. If you are selling or purchasing property, our inspections will meet the requirements for the Connecticut Recommended Septic System Inspection Report for real estate transactions. Admiral Septic also offers visual and video camera inspections of your septic system or sewer, and can also locate buried lines, underground tanks and utility lines on your property. If you need our emergency septic service to correct a system back up, our equipment will help to identify the problem, allow us to correct the problem and return your system to operating condition. Our standard inspection includes a detailed inspection of the tank, video camera inspection of the septic tank and the tank lines using our camera, and the septic system leaching field. Our reports are emailed to you, and include all photo-documentation of any issues found. If you have had an inspection by others that appears to be less than complete, feel free to call us. We are frequently hired by both sellers and buyers to reinspect systems. 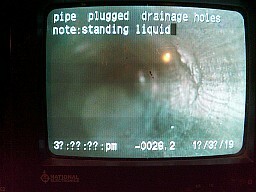 Additionally we inspect footing drain lines, grease trap tanks and lines, and buried utility lines. We recommend these services before you purchase real estate and at regular intervals after your purchase to maintain smooth operation of your investment. 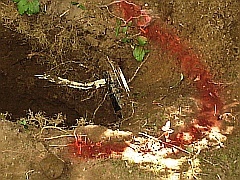 We can locate the routing of buried septic and well pipes, utility lines and underground septic tanks. We have found water wells under asphalt driveways and septic and drainage lines that were routed under outbuilding and finished garages. 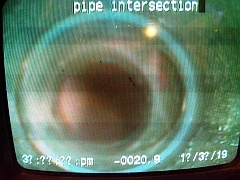 The photo shown here is a live power line (white cable) routed on top of sewer line (black pipe under white cable). This installation by others is not up to CT building, health, or safety codes, and could have resulted in a severe injury. Proudly offering complete septic pumpings, septic inspections, septic repairs, sewer connections and emergency services throughout Hartford County, Tolland County and Windham County, Connecticut including: Andover, Ashford, Avon, Berlin, Bloomfield, Bolton, Burlington, Bristol, Brooklyn, Chaplin, Columbia, Coventry, Colchester, Canton, Canterbury, Cromwell, East Granby, East Hampton, East Hartford, East Windsor, Ellington, Eastford, Enfield, Farmington, Glastonbury, Granby, Hartford, Hebron, Hartland, Hampton, Killingly, Lebanon, Manchester, Mansfield, Middletown, Middlefield, Marlborough, New Britain, Newington, Portland, Plainville, Plainfield, Pomfret, Putnam, Rockville, Rocky Hill, Simsbury, Storrs, Southington, Somers, South Windham, South Windsor, Stafford, Suffield, Scotland, Sterling, Simsbury, Thompson, Tolland, Union, Vernon, West Hartford, Wethersfield, Willimantic, Willington, Windham, Woodstock, Windsor and Windsor Locks. Admiral Septic offers 24 Hour emergency service and free estimates for both residential customers and commercial businesses.